Voice recording is a basic need for some people. The voice recording feature in iPhone may not be an essential thing for some people. However, the people who frequently record sounds around them need this feature very badly. Just like on iPhone, the need of sound recording is increasing on the Apple Watch. There are many reasons for this increasing demand. Well, we know that we don’t have an alternative to audio recording app on Apple Watch just like on iPhone. However, we have a lot of apps on App Store that allows incredible sound recording features on Apple watch as well as on iPhone, so we will present you the 3 best voice recorder apps for Apple Watch. The environments and integration of sound recording apps are apparently changed, but some apps are still providing the best services even for free. 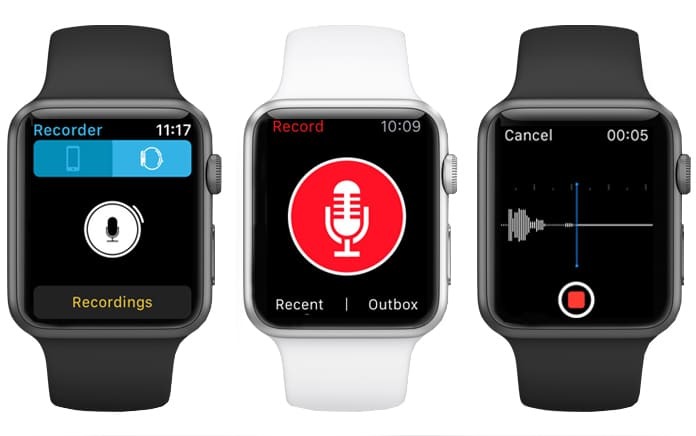 Here we will discuss some sound recording apps for your Apple Watch. Most of them are free of cost, and some of them need a little amount of money. 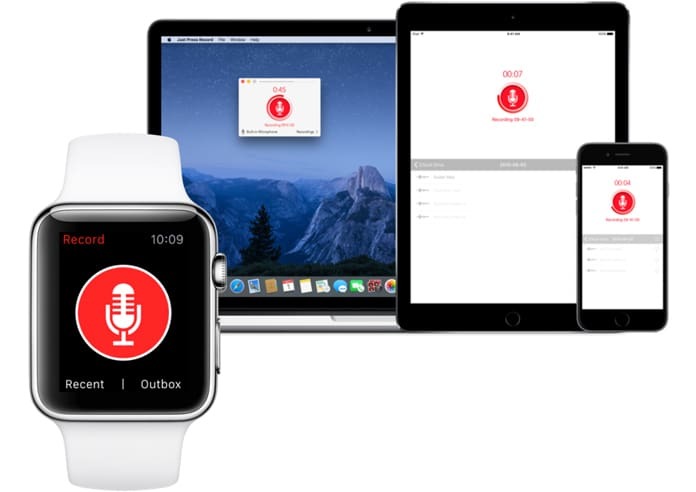 Have a look at the best voice recorder apps for Apple Watch. If you want to experience a simple and traditional experience of sound recording on your iPhone and Apple Watch, Simple Recorder is best for you. It is a free to install the app, and you can easily get it from the App Store. It has a straightforward and user-friendly interface that will give you all options regarding sound recording on your Apple Watch. 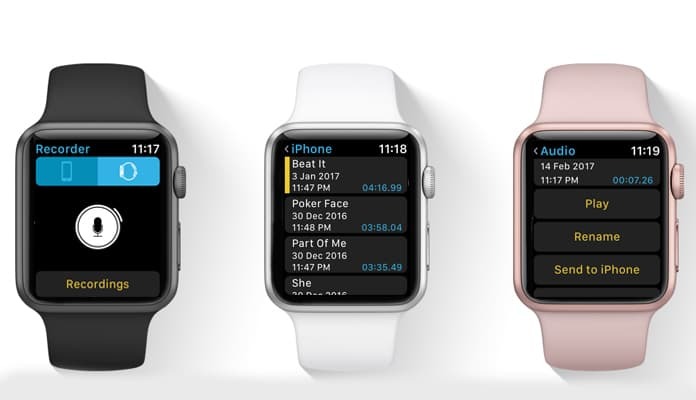 You can see a list of your recordings from your iPhone on your Apple Watch. You can rename them and send them to your iPhone as well. The best part of this app is it is free and doesn’t have any ads. It means you will experience a simple and ad free recording experience in both of your devices. Use this link to download this app for free. Just Press Record is a paid app, and you can buy this for just $4.99. This app has an amazing interface that allows you to record sounds on your Apple Watch without any problems. Just Press Record will give you a simple but best experience of recording sound on your Apple Watch. It enables you to record sound from your Apple Watch with a single click. You can record your sounds whenever and however you need. The best thing about this app is it automatically sends the voice recording to your iPhone with a track record of your recent audios. In other words, you will not have to send your recordings to your iPhone manually. 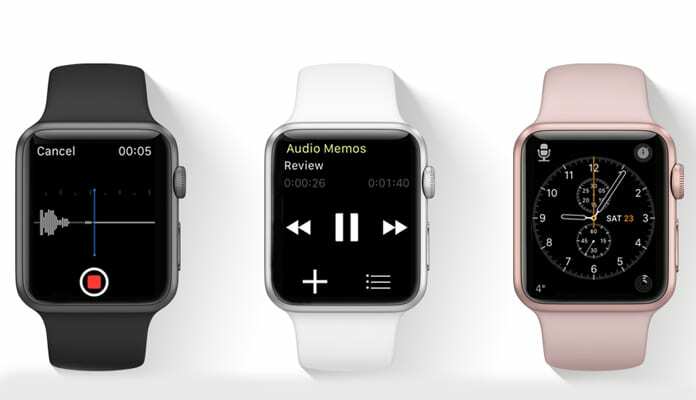 Moreover, you will be able to listen to your audio recordings from your Apple Watch. Getting all these features in just $4.99 from App Store is not a bad deal. Audio Memos is another great sound recording app that allows you to record your sounds in the way you want. The integration of this app is fantastic. It keeps recording your sounds even after the accidental movements of your wrist. Moreover, the recording will only stop when you abandon it. You can use your recording in both of your devices, i.e. your Apple Watch and iPhone. This is a paid app, and you can get it from App Store for $0.99. All these apps are best and provide the best sound recording experience. All you need is to choose one of the best voice recorder apps for Apple Watch and download it from the App Store.